Orange Rolls for the Holidays or Whenever! When I was a young girl and a new bride, I was impressed with the ancient aunts from a far off land who shipped orange rolls to the Jaggers Family for the holidays. Their happy hour hijinx were legendary and I knew I’d found ladies to emulate for the ages. I don’t use the aunts’ original recipe for orange rolls — I’ve found one that’s lighter, fluffier and more to my liking. Warm a quart of whole milk, a cup of sugar and a cup of vegetable oil over medium heat. Heat to steaming, then remove from heat and let cool to room temperature. Sprinkle two packets of fast acting yeast over the milk. Add 8 cups of all-purpose flour and mix to combine. Cover with a clean dishtowel and let rise for an hour. Come back and add a tsp. of baking powder, a tsp. of baking soda, a tablespoon of salt and a cup of flour. Mix well. Roll half the dough at a time into a big rectangle. 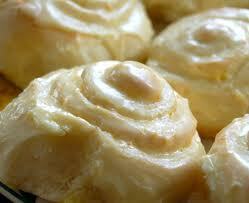 Pour a cup of melted butter over the dough and spread with 8 tbsps. of orange marmalade, a half cup of brown sugar, a couple of tbsps of orange rind and a half cup of white sugar. Roll up and slice — put about six slices in a buttered cake pan (should fill about six pans total). Set aside to rise for about 20 minutes. Heat oven to 375. Bake for 15-18 minutes. While baking, mix 2 lbs. powdered sugar, 1/2 cup melted butter, 1 cup whole milk and 1/2 cup orange juice. Pour icing over hot rolls when they come out of the oven. 2 Responses to Orange Rolls for the Holidays or Whenever! Sounds heavenly. How do I make just one pan? 🙂 Are you shipping them? I don’t think it’s possible to make just one pan. And why would you want to? You can freeze and reheat them! I suppose you could cut the recipe in half (three pans). And no, I’m not shipping any this year. Kind of behind schedule.